Are you up to your elbows in holiday baking yet? I sure am! 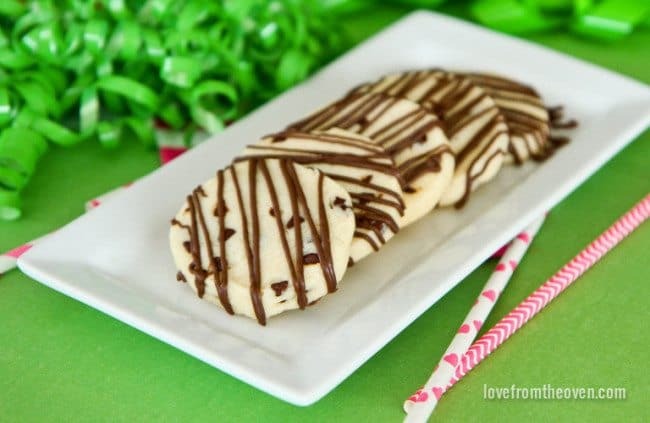 Today I’m going to share some a recipe for delicious shortbread cookies with you, and the great thing about this recipe is that you can divide the dough into three, and make three totally different shortbread cookies with it. One batch of dough, three types of cookies, three fabulous flavors. Did I mention that the base dough only has FOUR ingredients? Yep, we are keeping its simple. And delicious! SMART COOKIE TIP: Make one batch of dough that lets you create multiple types of cookies. There’s no denying that the holidays can get pretty busy and time can often be in short supply. That’s why for this week’s post in my holiday cookie series with McCormick, I am sharing a way for you to create some delicious cookies and save some time while doing it. I always like to offer a lot of variety in my holiday baked treats, but that variety can take a lot of time. With this recipe you make a single batch of shortbread cookie dough, and from that dough you create Chocolate Chip Shortbread Cookies, Cranberry Orange White Chocolate Cookies and Peppermint Shortbread Cookies. SMART COOKIE TIP: Transform a basic shortbread recipe with a variety of flavors. And to save even more time, you can roll each type of cookie into a log, and simply slice and bake your cookies versus cutting them out. SMART COOKIE TIP: Save time by rolling cookie dough into a log, allow you to simply slice and bake. To start you will make your base dough, which only requires four ingredients – butter, sugar, flour and McCormick Vanilla Extract. Four simple ingredients, how great is that? After combining these ingredients with your mixer, you have your base dough. Once your base dough is mixed, you will pull out 2/3 of the dough (don’t worry if it’s not exact, that’s okay!) and divide that into two bowls. 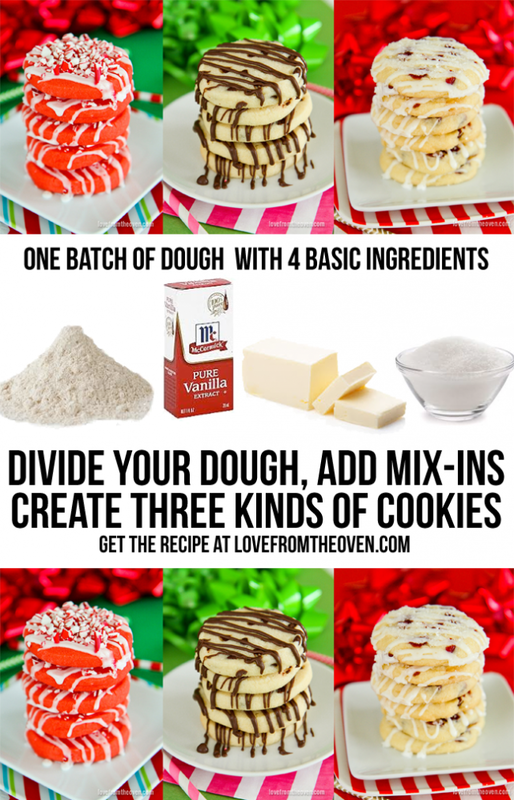 At this point you will still have 1/3 of your dough in your stand mixer/mixing bowl – leave that dough there, and two separate bowls, each holding 1/3 of the dough. For your Chocolate Chip Shortbread Cookies, you will stir in 2/3 to 1 cup of chocolate chips. Mini chips work best, but full size chocolate chips are just fine. Mix those chips in with your dough. By hand, shape your dough into a log, about 1 and 1/2″ thick, wrap with plastic wrap, and place in the refrigerator to chill. 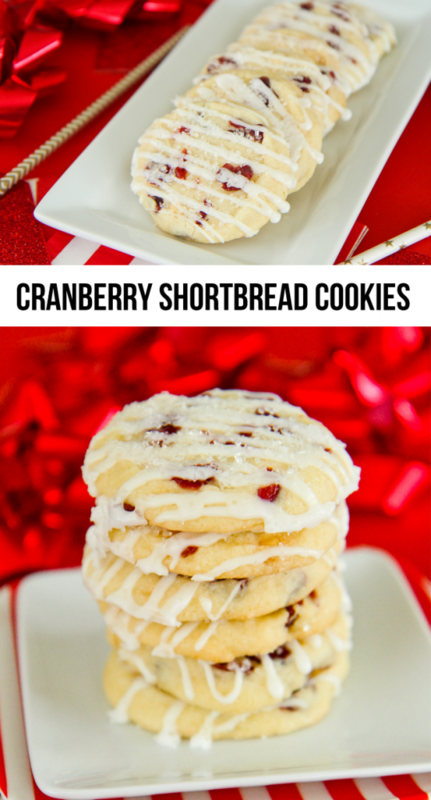 For your Cranberry Orange White Chocolate Shortbread Cookies, you will stir in 1/2 to 2/3 cups of white chocolate chips and 1/2 to 2/3 cups of dried cranberries to your dough. Just like with the chocolate chip dough, you will roll it into a log, wrap with plastic wrap and place in the fridge to chill. For your Peppermint Shortbread Cookies, you are going to work with the dough that is still in your stand mixer or mixing bowl. For this dough, you are going to add one teaspoon of McCormick Pure Peppermint Extract and McCormick Red Food Coloring. For the food coloring, you can play with the amount to get the shade you like, from a pink to a light red. Mixing in the food coloring and peppermint extract takes a bit more work than stirring in chocolate chips, which is why you want to use your mixer. 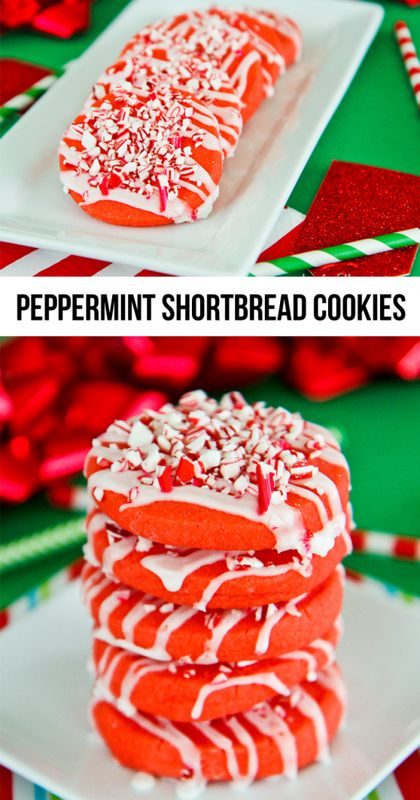 Once the peppermint extract and food coloring are worked into the dough, if the dough seems sticky, add 1-2 tablespoons of flour and stir to combine. Because you are adding liquid to your dough, the extra flour will help balance out that liquid. 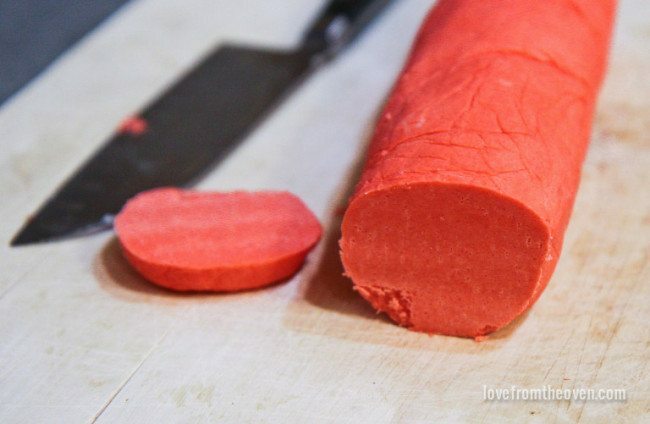 Roll the dough into a log, wrap with plastic wrap and chill. If you are short on time, you can even place your dough into your freezer. If you can freeze it for at least an hour, that will do. If you have more time or want to make your dough up to 24 hours in advance, just let it hang out in the fridge for anywhere from 2-24 hours. Once you are ready to bake you will simply slice each log of dough into 12 round cookies, and then you are ready to bake. For the chocolate chip cookies, I sprinkled a little coarse sugar on my cookies just prior to baking, it’s optional, but ads a nice touch. After baking, you will allow all of your cookies to cool. 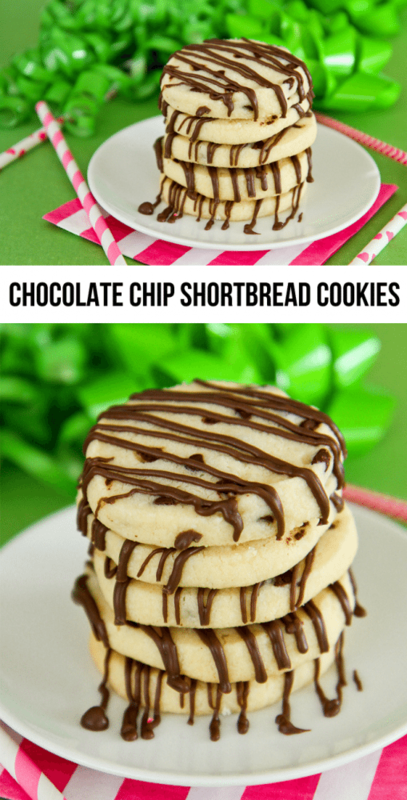 The chocolate chip shortbread cookies can be left as is, or you can drizzle some melted chocolate onto them, or even dip part of the cookies in melted chocolate. 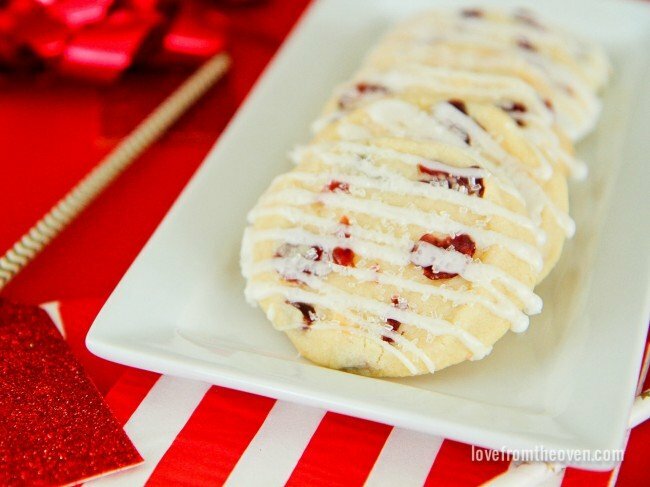 Your Cranberry Orange White Chocolate Shortbread Cookies and Peppermint Shortbread Cookies are going to each get a glaze, and to keep it simple, you will make one batch of glaze, split it in half, then flavor. The Cranberry Orange White Chocolate Shortbread Cookies get their “orange” from McCormick’s Pure Orange Extract. While cranberry and orange is a classic combo, I also think this is delicious with McCormick’s Pure Lemon Extract, so feel free to use either extract! Your peppermint glaze gets a great minty kick from McCormick’s Pure Peppermint Extract. Each glaze is simply drizzled over your cookies. While you can drizzle off a fork or a spoon, I like to transfer my glaze to a plastic sandwich bag, make a very small cut clipping off one of the bottom corners of the bag, and I then squeeze my drizzle out of the sandwich bag. SMART COOKIE TIP: Place glaze or icing in a plastic sandwich bag, snip off a bottom corner of the bag, and use the bag to “pipe” your glaze onto your cookies. In a large mixing bowl or stand mixer, beat butter until creamy. Add sugar and beat on medium high until light and fluffy, about 2-3 minutes. Stir in vanilla until combined. Add flour and mix until well combined, but do not over mix. Remove 2/3 of dough mixture from the bowl (leave 1/3 of dough IN the mixing bowl), and place dough evenly divided into two bowls. For Chocolate Chip Shortbread, add chocolate chips to one bowl of dough and stir well to combine. Form dough into the shape of a log, approximately 1 and 1/2 inches thick. Wrap tightly with plastic wrap and place in fridge to chill. 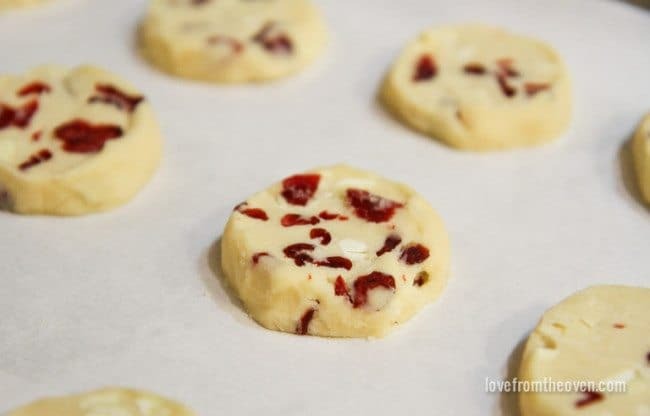 For Cranberry Orange White Chocolate Shortbread, add white chocolate chips and chopped dried cranberries to one bowl of dough, and stir well to combine. Form dough into the shape of a log, approximately 1 and 1/2 inches thick. Wrap tightly with plastic wrap and place in fridge to chill. 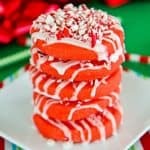 For Peppermint Shortbread, add 1 teaspoon peppermint extract and 25-50 drops of red food coloring to dough (depending on shade desired) and mix well with mixer. If dough seems sticky, add in 1 to 2 extra tablespoons of flour. Form dough into the shape of a log, approximately 1 and 1/2 inches thick. Wrap tightly with plastic wrap and place in fridge to chill. Chill all doughs for at least two hours. In a rush? Dough can be placed in freezer for one hour for a quick short cut. Remove one log of dough from fridge. Allow to sit at room temperature for approximately five minutes. Using a sharp knife, cut into 12 equal sized pieces. If dough flakes slightly when cutting, use hands to help push dough together, the warmth of your hands will do this easily. Place cookies onto a baking sheet lined with parchment paper or a silicone baking sheet. For Chocolate Chip Shortbread, feel free to sprinkle tops of cookies with coarse sugar. Bake for approximately 12 minutes, or until bottoms are starting to lightly brown. Remove from oven and allow to cool completely. Repeat with remaining two logs of dough. 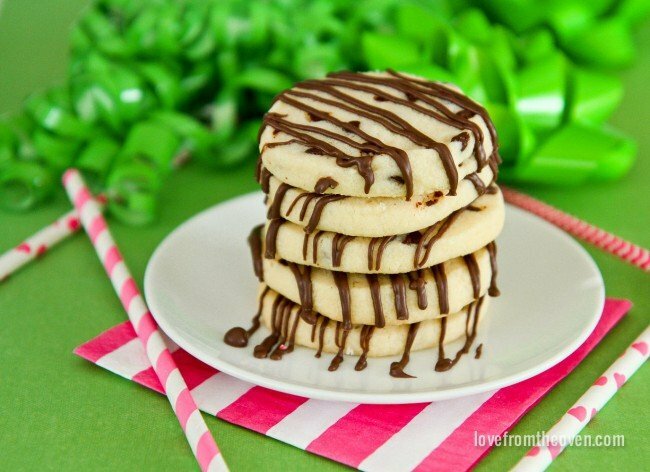 If desired, melt a small amount of your favorite chocolate to drizzle over cookies or to dip cookies into. Allow chocolate to set up completely prior to serving. Combine powdered sugar, vanilla extract and water in a bowl, and stir until well combined (no mixer needed). Glaze should be the consistency of a thick syrup. If glaze is too runny, add in more powdered sugar, a teaspoon at a time. Pour half of the glaze into a separate bowl. For Orange Glaze, add one teaspoon of orange extract to the glaze, and stir well. 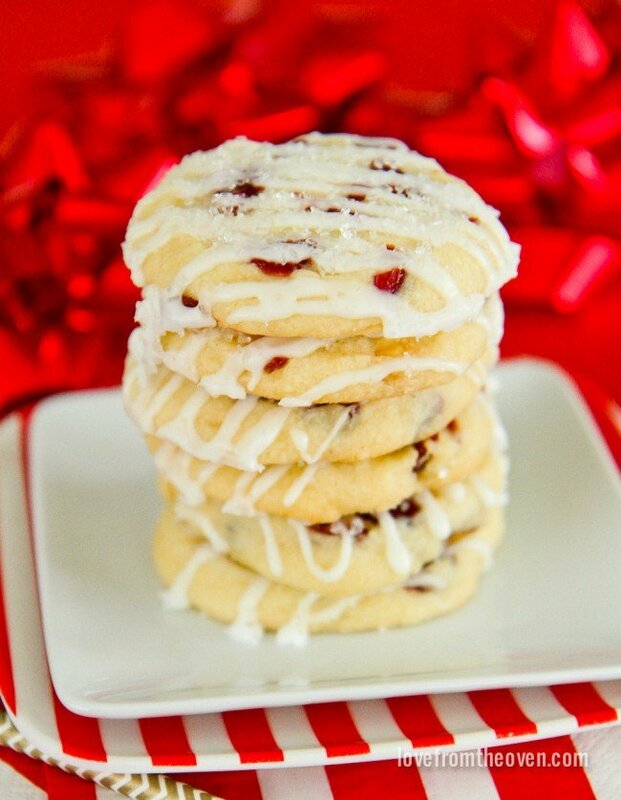 Drizzle over Cranberry Orange White Chocolate Cookies. Sprinkle with coarse sugar if desired. Allow glaze to dry prior to serving. Remember, you can also use lemon extract in place of orange! For Peppermint Glaze, add one teaspoon of peppermint extract to the glaze and stir well. 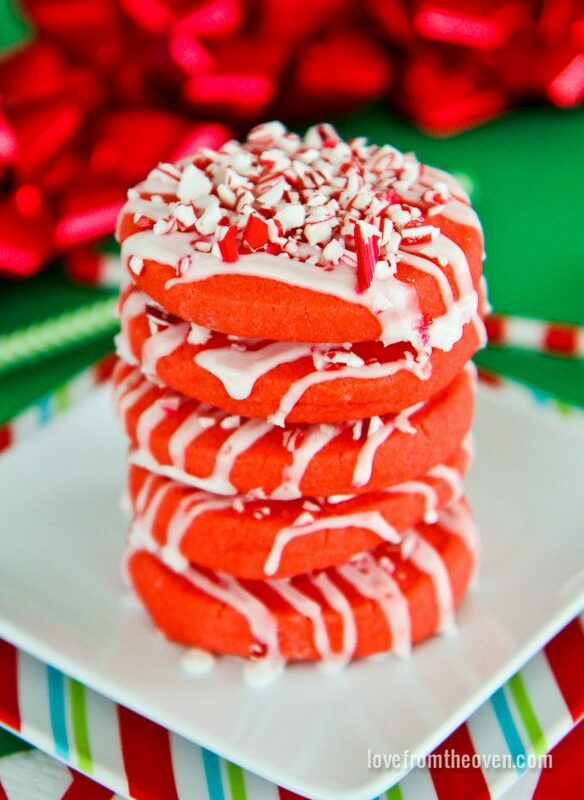 Drizzle over Peppermint Shortbread Cookies. Sprinkle with crushed candy canes if desired. Allow glaze to dry prior to serving. I hope that your family enjoys these cookies as much as mine did, and that this recipe can help save you some time this holiday season. Make sure to check out my other posts and recipes for great holiday cookie tips to help make your holiday cookie making, baking and decorating simple, easy and delicious! 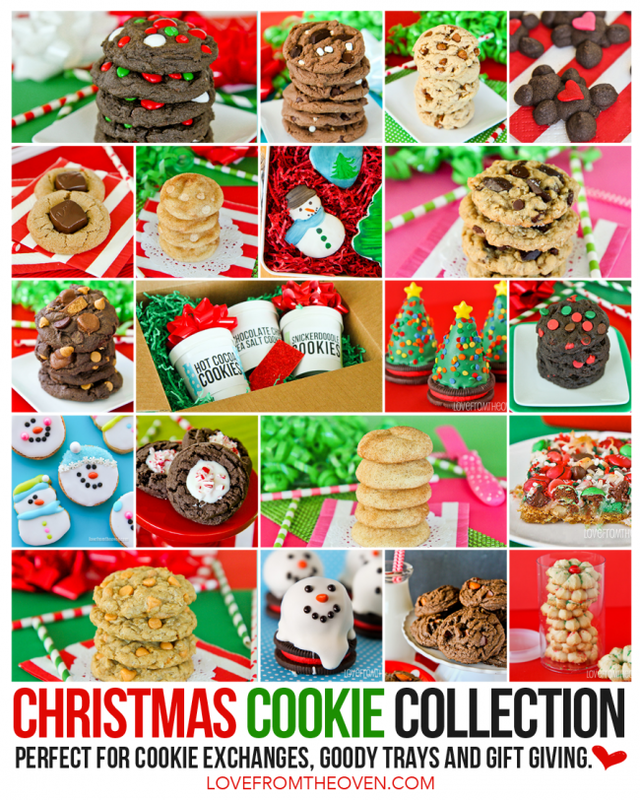 Make sure to check out all of my recipes for Christmas Cookies and Holiday Cookies! Disclosure: This post was sponsored by McCormick. All opinions are mine and mine alone! Yum! I am glad I found this post .. I was looking for new cookie recipes to make for Christmas. Thanks! What an awesome idea! I love that I can make three different cookies with the same base cookie dough!! Not one but THREE- thanks for sharing they all look wonderful. This is such a great idea! Love that you can get three varieties out of one recipe! Approximately how many cookies of each type (or the whole batch) will this recipe make? Thanks! Anette, I got 12 from each type of dough, so three dozen total.